Maj. Gen. Joseph Wheeler served in two armies, playing a major role in the development of Confederate cavalry in the Civil War's western theatre, and, more than thirty years afterwards, commanded troops in the Spanish-American War. After leaving the U.S. Unfortunately, due to sales rights restrictions, we cannot offer A Soldier To The Last for sale in your country. Maj. Gen. Joseph Wheeler served in two armies, playing a major role in the development of Confederate cavalry in the Civil War's western theatre, and, more than thirty years afterwards, commanded troops in the Spanish-American War. After leaving the U.S. Army to join the Confederacy, Wheeler served in artillery and infantry units before joining the cavalry. Subsequently, he fought at Shiloh, the Battle of Murfreesboro, and other engagements. As a cavalry commander in the Army of Tennessee from mid-1862 almost to the war's end, he raided Gen. William T. Sherman's lines of communication and contested his advance in the final Carolinas campaign. In addition to detailing Wheeler's Civil War experience, Edward Longacre discusses Wheeler's youth and education at West Point, his pre-Civil War service in the Regiment of Mounted Riflemen, his post-war business, his political career as a congressman from Alabama, and his colourful service in Cuba as a major general of volunteers during the Spanish-American War. 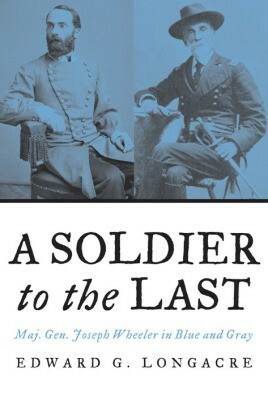 Longacre also seeks to correct errors and misconceptions about this Civil War figure that have become a part of the public record, making Joseph Wheeler's life and career accessible to a new generation of readers. “A Soldier to the Last” will be a valuable addition to the library of anyone interested in Civil War history and U.S. military history.